instruments, journals, art supplies, or anything else to make you feel at home! *If you are unable to bring linens, you can rent them from Earthdance for $10. **Earthdance no longer provides towels for free. Please bring your own. If needed, you can rent towels at $2 each. ***New England weather is generally cold in the winter, with snow. In the spring, it can be quite muddy. Summer can be warm during the day and cool at night. Fall temperatures range from very warm to quite chilly. We advise checking the forecast while you pack. Housing is provided in the Gratitude Lodge, which is just next door to our Farmhouse at 262 Prospect Street. The dormitory has 3 floors of co-ed housing for guests, with rooms ranging from 3 to 12 occupants, and shared bathrooms. A private, handicap accessible bathroom is available on the first floor. A few private rooms are sometimes available for an additional fee (check with the Earthdance Office in advance). Most beds are singles, though a few doubles are available. For all of our beds, we provide pillows and blankets. We do have extra blankets available for cold nights. All of our beds are first come, first choose. During summer, guests have the option to bring their own tents and camp on our land during their stay. You can use the bathroom facilities in our main house. If you bring your own tent, you are also responsible for bringing your own bedding. For some events, a small discount is available for camping. 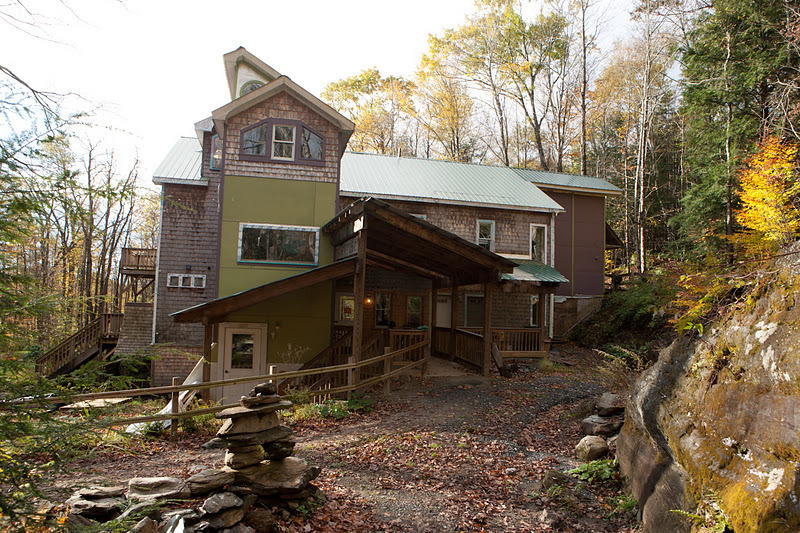 Our facilities feature our dormitory, our Farmhouse, a wood-stove sauna, a stream-fed quarry, and 125 acres of land. The Farmhouse is our main building. It features two beautiful dance studios with sprung floors, as well as a smaller movement space and a massage room. The Farmhouse also contains a dining room, a living room, and a library. It also houses our main kitchen, where the Earthdance head cook is busy at work preparing meals. 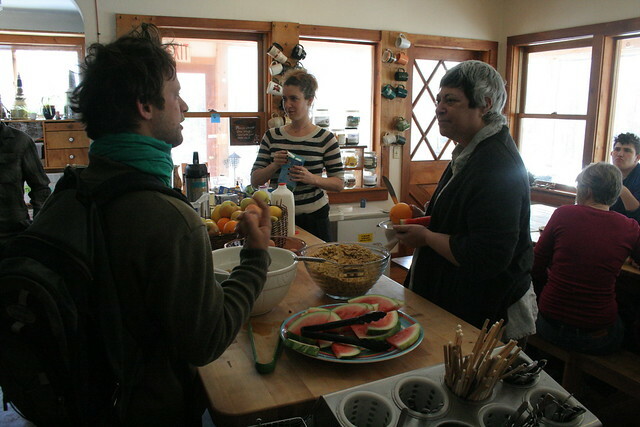 (The kitchen is not available to guests during workshops and programs; however, guests on personal retreats may cook their own food there, depending on other events). 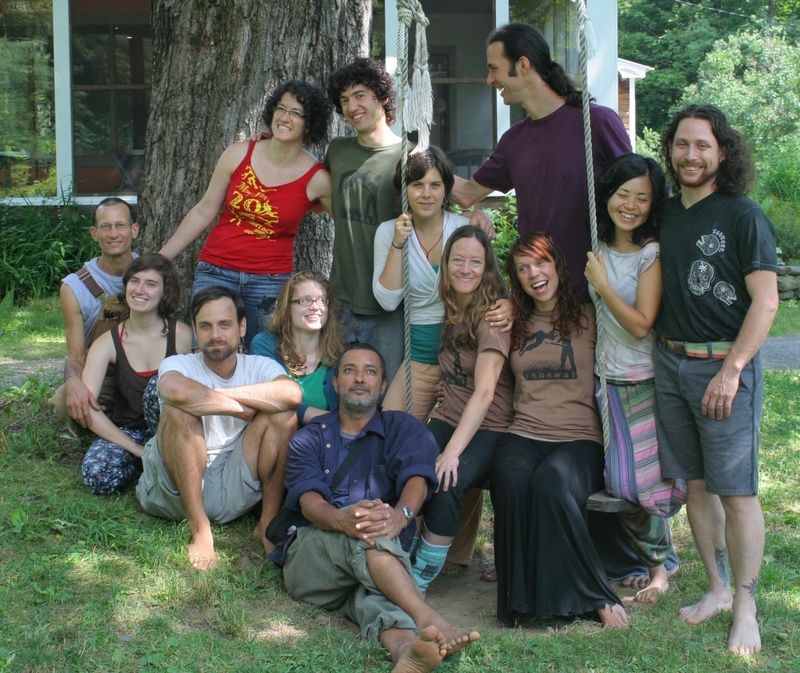 Earthdance began as a community, and there is currently a small residential staff living in community here. While you are at Earthdance, we invite you to become part of this community. Many of our events, particularly our 3 and 5 day contact improvisation jams, seek to create a sense of community among the participants. During your stay, you will probably be asked to participate in some sort of chore, generally cleaning up after meals or helping to keep the house clean. We appreciate your cooperation in helping out around the house. At the dormitory, we encourage quiet hours between 9pm and 9am. Almost all rooms are shared, and we invite you to be respectful of your roommates' needs for rest. Cell phones do not always work at Earthdance, so please do not depend on your cell phone. We have a phone line that is for our guests to use. You can use this phone to make and receive calls. The number is 413-634-0111. Feel free to give this number to friends and family so that they can reach you while you are at Earthdance! There is a shared voicemail box on the phone, which guests can check, and record messages in the phone log. We offer free long distance within the United States. For international calls (including Canada), please bring a calling card. We have limited internet access available. There is a computer available for guests who wish to check their email, with wireless access in most of the main Farmhouse. Earthdance accepts 10% of sales from all vendors including bodyworkers. All bodywork sessions must be scheduled ahead of time, and if scheduled during an event, must be scheduled before the event begins. During Rental Groups, Earthdance workshops, festivals, and the Fall and Spring Jams, bodyworkers can schedule bodywork sessions at Earthdance without paying event entrance fees, with the understanding that the bodyworker will abstain from participating in programming or meals and depart the facility immediately after a session. During the July 4th Jam and New Year's Jam, our two largest events, those who want to schedule bodywork must register for the jam ahead of time as a regular participant--either for the full jam or as a one-day participant--and pay posted entrance fees. This is because these two events fill to capacity and by just being present at Earthdance during these times, one is taking part in the event. Questions? Email contact@earthdance.net or call 413-634-5678.